Some books can change our lives. It can be a character we relate to, an idea that never occurred to us before or a story that becomes part of fabric of who we are. 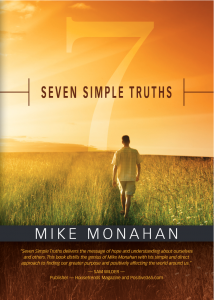 Seven Simple Truths by Mike Monahan introduced me to some new truths that has changed my perspective on a few important life matters. One of the beautiful aspects of the book is how it will resonate in different ways depending on the age of the reader. If you don’t know Monahan’s work you may be challenged by some of the ideas and observations in the book. You may feel like he has you standing on your head at one point or another. When you finish, you will have grown from being introduced to simple concepts of how we live and think from an enlightened master of the human condition. There were three nuggets in Seven Simple Truths that resonated greatly with me. The first was the idea that I have been loved greatly in life but not in the ways that I imagined. I had never really stopped to consider the many people who have taken an interest in me and have loved and accepted me for who I am at critical periods in my life. The second great insight is that I am always trying to prove to the world what I don’t believe about myself. Knowing that doesn’t keep me from pursuing my passions. Instead, it gives me an understanding of my motivations. The greatest “ah-ha” moment in the book was chapter four. Our lives are a process and it’s not possible to skip a step. As I took a moment to look back at the decades that make up my life, I realized that each “step” lead me to the next. Even though there were challenges in many of those decades, I would have stumbled and fallen without those needed steps. It inspired me to be even more aware and appreciative of each moment – then and now. Seven Simple Truths leaves us with a plan and a direction. 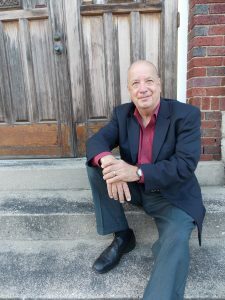 Mike Monahan has a simple way of taking life’s greatest challenges and making them seem simple. If you are ready for a deep dive into what your life is about, give Seven Simple Truths a chance. You’ll find your steps easier to negotiate.